During the first segment of the show, Romero-Severson, a plant geneticist and professor of biological sciences, will speak about her work on plant microbiomes. Romero-Severson and Shaun Lee, a microbiologist, have discovered a unique, highly motile gram-positive bacterium packaged inside mung bean seeds (Vigna radiata), the source of bean sprouts. This bacterium can colonize V. radiata during seed imbibition and germination without causing any harm to the plant. The recent outbreaks of foodborne illness linked to contaminated seed sprouts may be prevented by naturally occurring protective commensual bacteria like the one they have recently discovered. These bacteria, in defending the seedling against plant bacterial pathogens, may also defend against human pathogens that can persist on seedling surfaces. Director of the Notre Dame Environmental Change Initiative, Lodge is a world-renowned expert on invasive species. He is the Ludmilla F., Stephen J. and Robert T. Galla Professor of Biological Sciences, served as the first chair of the national Invasive Species Advisory Committee and was the lead author of the Ecological Society of America’s paper calling for a stronger government response to the problem of invasive species. His research has identified global hot spots for biological invasions from ballast water and examined the best options for managing these invasions. His research has produced guidance used internationally to help reduce the introduction and spread of invasive species by commercial vendors in the nursery, pet and fish market trades. During another segment of the show, Collon, associate professor of physics, will discuss his work that utilizes accelerated ion beams to pinpoint the age and origin of material used in painting, pottery, metalwork and other forms of art to serve as powerful forensic tools to reveal counterfeit artwork without the destruction of any sample, as required in some chemical analysis. 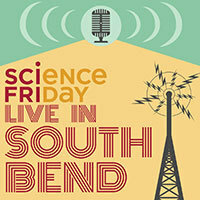 He will be joined by Greg Smith, chief scientist at the Indianapolis Museum of Art. Other segments of the show will include interviews with the Kellogg Brothers with Howard Markel, a representative speaking about the Studebaker electric car, and Anne Perez from Saint Joseph’s College of forensic entomology. This event is part of the celebration of 150 years of science at Notre Dame. “We are excited to share our research discoveries with our local community and thousands more across the nation,” said Gregory Crawford, the William K. Warren Foundation Dean of the College of Science. Originally published by Marissa Gebhard at news.nd.edu on October 10, 2014.